* Charter: there's a charter Saturday for a retirement party. Some train crew may be needed for that. * Tree cutting: Starting at the north end (by the bridge) and working south. Be careful coming off the south end of the bridge, the ground is very rough (until we get snow on it). * Historical group meeting: Dave and I (and maybe others, not sure) will be attending a morning meeting of local historical groups. Part of the reason is to get ready for Maine's 200th anniversary in 2020. * Machine shop: crane rails and insulation. Removing my work crew call for Saturday as it interfered with previous plans. Will plan rescheduled work for next week. 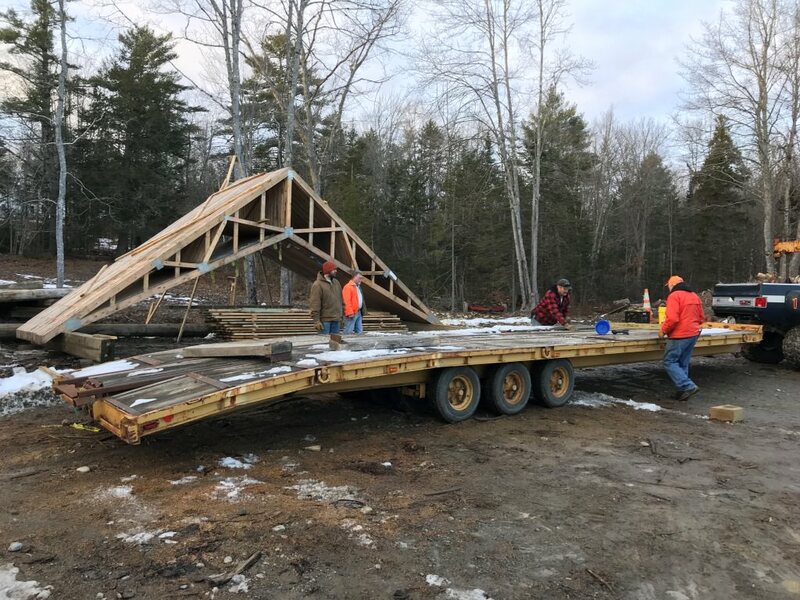 * Pavilion: the trusses were removed from the trailer and stacked nearly vertically at the west end of the parking lot. We had a few exciting moments during the whole process. Then all the 2xs and boards were stacked underneath. * Machine shop: the Bay 1 east crane rails were raised to the rafters and attached. * Historical group meeting: Dave and I attended, and learned that everybody has a problem with storing archives! 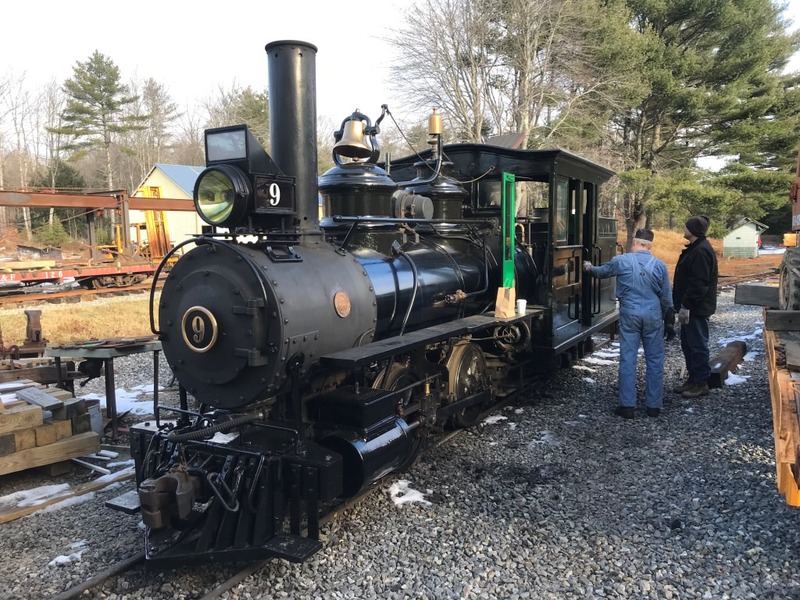 We also became acquainted with the President of Boothbay Railway Village. Not a great deal of discussion about the 200th. No tree cutting occurred. And now that the trailer is empty it can be flipped over and repaired soon. Great, Great teamwork today got a lot done. Exciting moments? Was it windy? It wasn't windy, but with the trusses standing nearly vertical they were unstable for a time. Mike was up on the pile halfway through stabilizing when it started to tilt, but we caught it in time. There was also a charter today with 41 passengers; a retirement party for a local railroader and enthusiast. A number of guest worked in the rail industry and were very impressesed. Yes, that was going to be the worst ride in Alna, well, maybe 2nd worst ride after the dozer slide last winter... But, it made for a very satisfying afternoon. We had something to get done, and we finished it. We were going to start tree cutting, but I got up there this morning and hunters were on the grade, waiting for the deer to walk through. 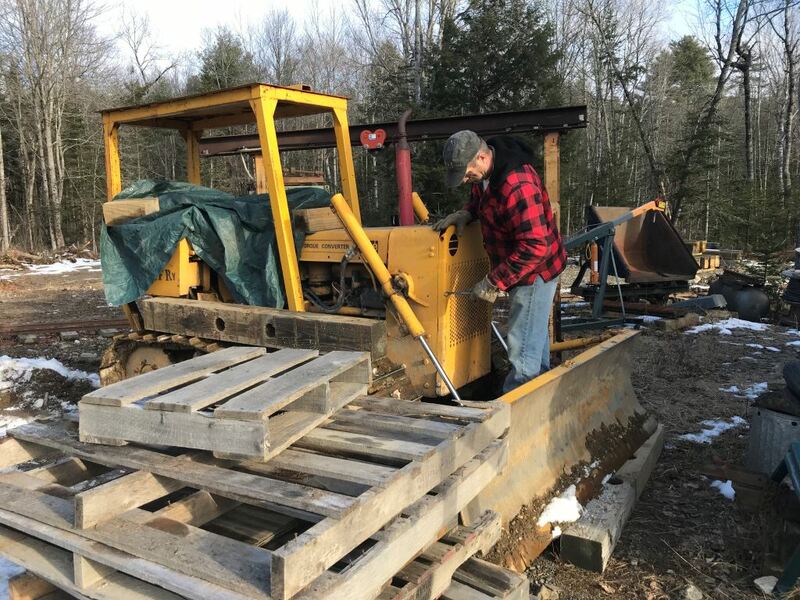 So, I abandoned that plan and started winter repairs on the dozer.. Some photos from today. A good weather day, particularly for early December. Mostly sunny (it has been a very wet fall) and temperatures in the mid 30s. 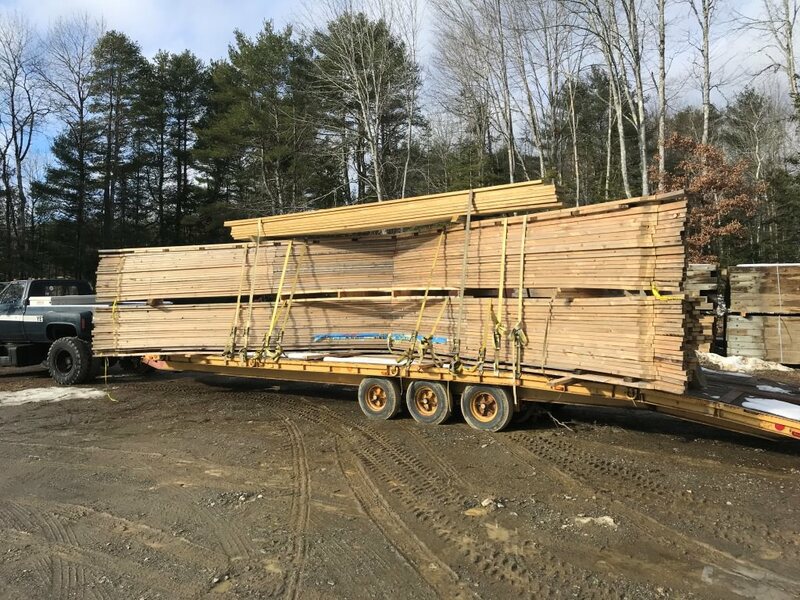 The biggest project today was getting the Pavilion trusses and lumber unloaded today, to get the trusses stored for the winter and free up the trailer to pick up the dairy car from Wiscasset. Here's how the trailer looked around 10 a.m. today. 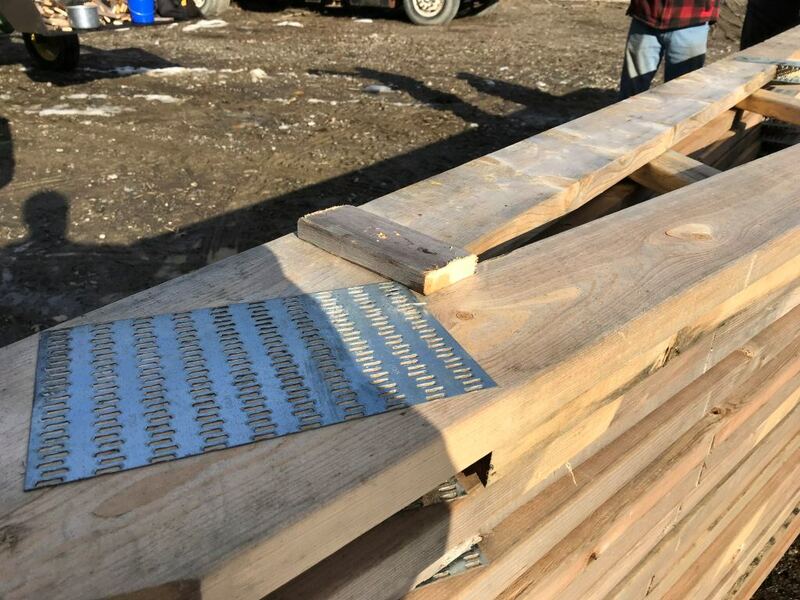 Eric Schade accepted the challenge to prepare an area next to the wooden guardrail post piles to store the trusses for the winter. 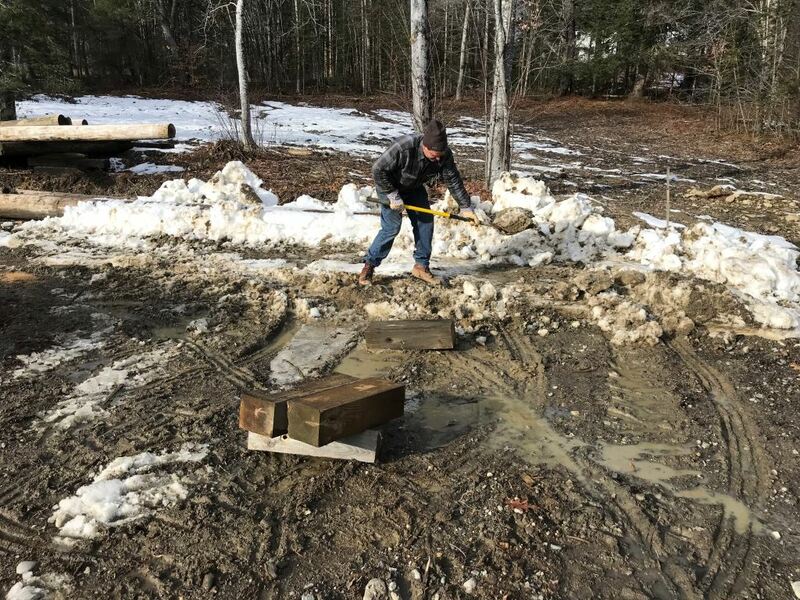 Here Eric is leveling the ground to set blocks shortly after 10 a.m.
Two large wood beams, spaced 30 feet apart were then placed on the blocks Eric had set. 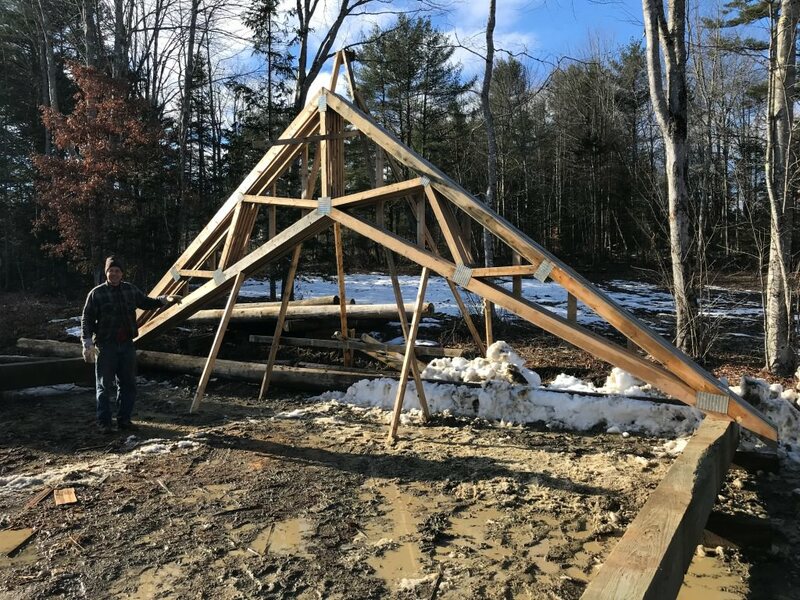 Eric then built an A-frame support to hold the trusses vertical as they were placed for storage. This view is a little after 11 a.m. -- about an hour after the prior photo. 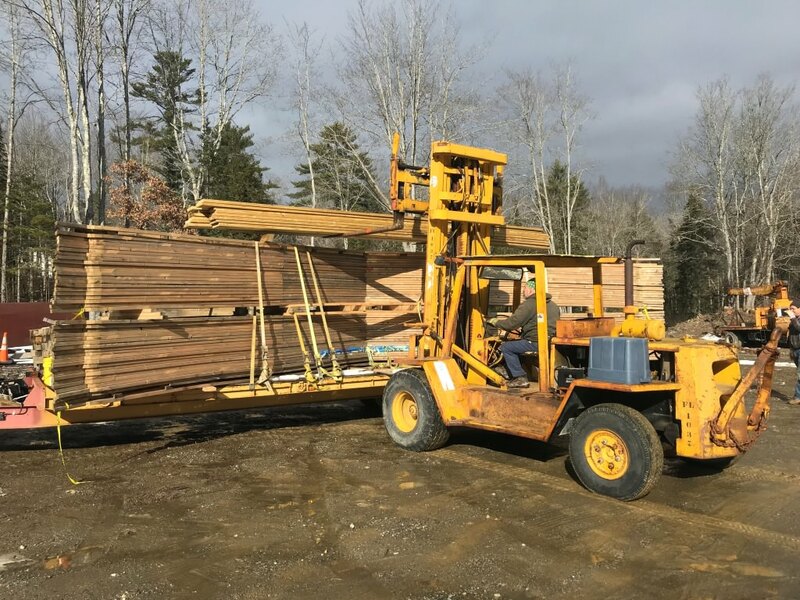 Shortly after 11 a.m., Brendan Barry used the forklift to take off the lumber loaded atop the trusses from the trailer. 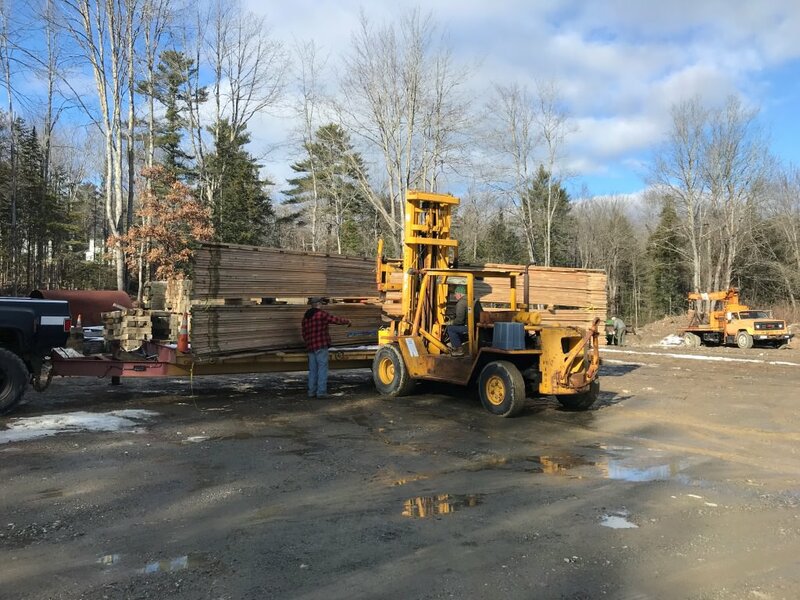 After lunch, Brendan used the forklift to pick up the first set of 21 trusses from the trailer. 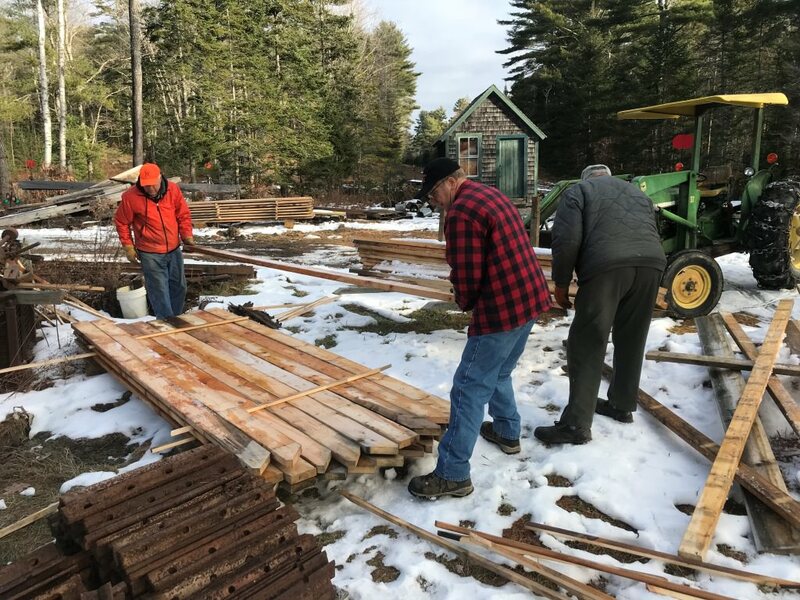 Time is 12.21 p.m.
Strapping Fred Morse cut 160 6-inch pieces of strapping today to space the stored trusses apart so they will dry out between storms this winter. Brendan is seen installing a piece of strapping at 12.26 p.m. 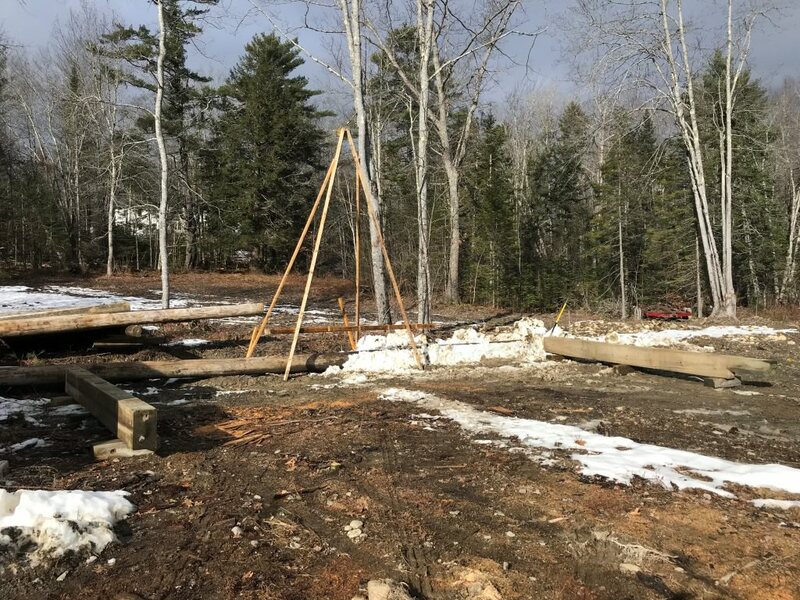 The first few trusses have been placed vertically in storage at 1.03 p.m.
An hour and 20 minutes later, a view on progress. Mike Fox (left) added cross-straps for stability to the trusses as worked progressed. 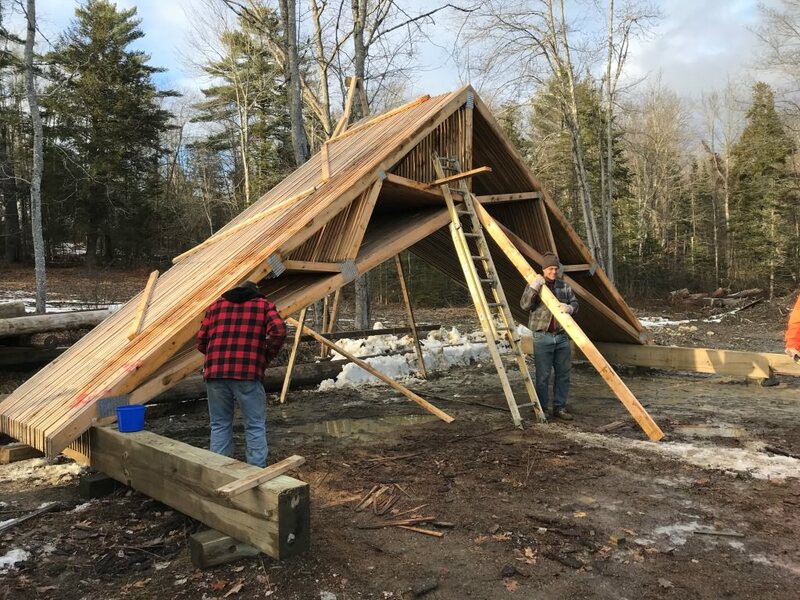 By 3.15 p.m., all 41 trusses had been placed, and other pavilion lumber was placed in storage underneath. Dave looks on in amazement. The empty trailer, with (left to right) James Patten, Dave Buczkowski, Mike Fox and Zack Wyllie. We had as many as eight working on the truss storage as the day progressed. 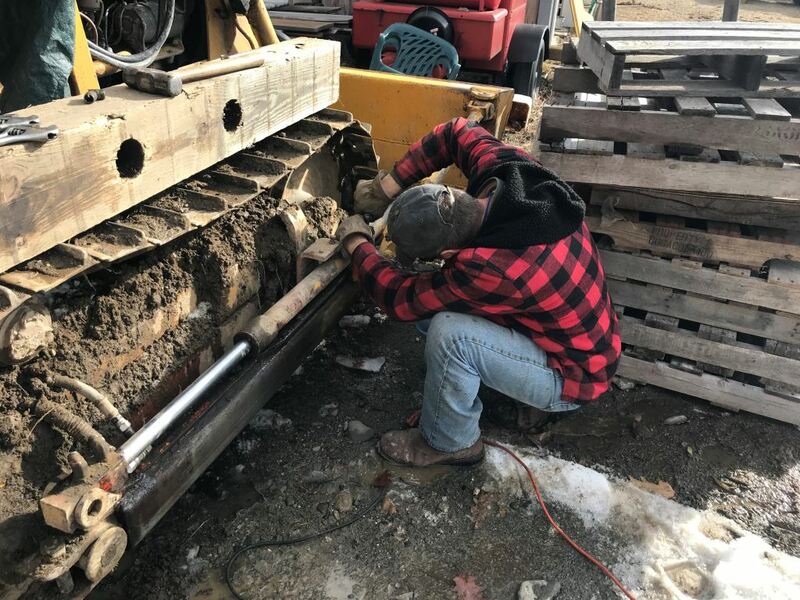 In the morning, as site preparation work was underway by Eric for truss storage, Mike took pieces of Casey apart to address a few hydraulic leaks. First was the front to get at a hydraulic motor leak. Followed by the horizontal right piston for the blade. Alan Downey has been leading the effort to re-arrangement machinery in the shop building and install crane rail in bay 1. 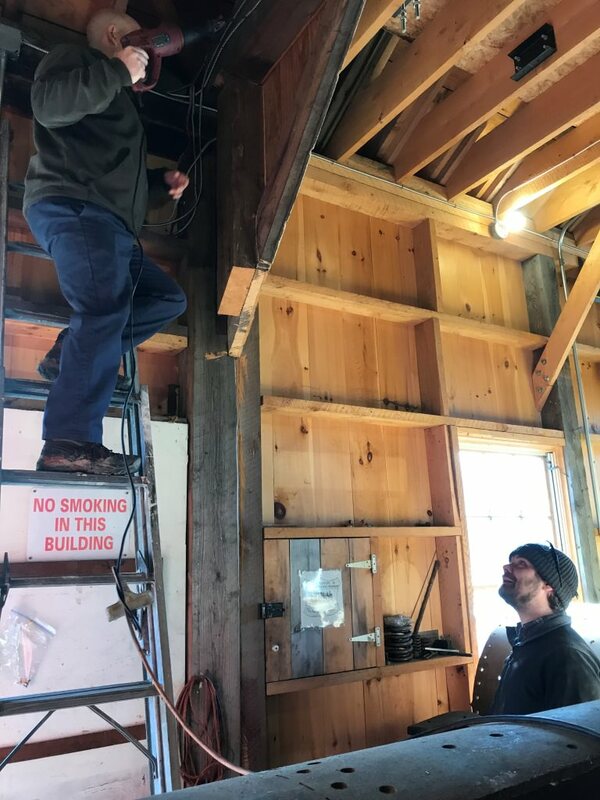 In the morning, Brendan assisted by cutting away sheathing between the original bay 1 and its extension to make room a crane rail, as Alan looks on. Meanwhile, we ran a charter train today. In the morning, Gordon Cook and Eric Schade chat as #9 was prepared for the day. 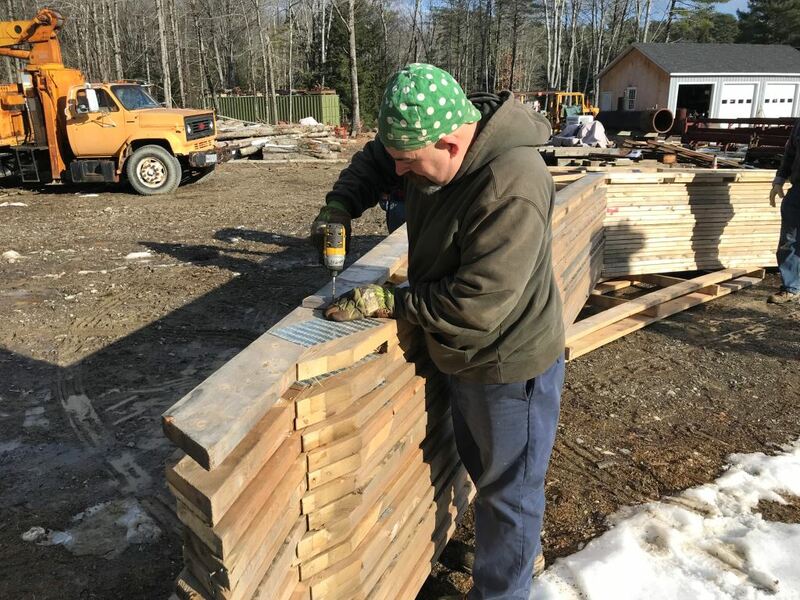 In the morning between 7:15 and 10:30 Zack and I and Steve Z. moved short boards to the carpenter shop to cut into sticks to stick the lumber then moved a large pile of 2"by 10's, 2" by 4"s and boards to different locations and stuck them. Stewart Rhine also help in sorting the lumber. Thank you Bill for the photos and comments of that very busy day. I admire the association great sense of communication towards its members and the others. Communication is essential nowadays and I wish some French tourist railroad associations leadership understood that. 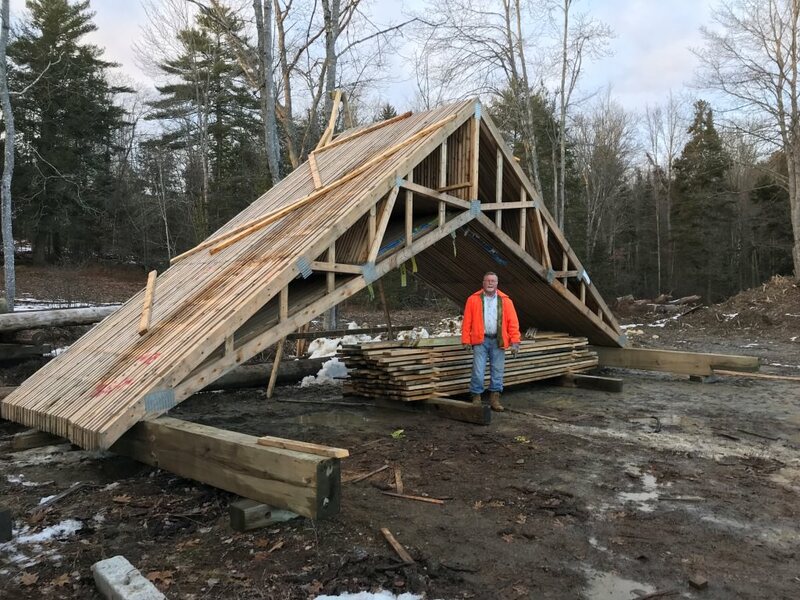 As Fred mentioned, he and Zack were busy before work started in earnest on the trusses yesterday. Here's a photo I should have posted last night of Zack, Stewart and Fred stacking some lumber from the pavilion near the B&SR tank. Looks like it was a very productive day. Bill Reidy, thank you very much! You are already demonstrating that the Newsletter will be in very good hands when you assume the reins from John McNamara. And John, many, many thanks for your long service in keeping us informed!